Early May has always been a popular time for Apple to introduce new notebooks. 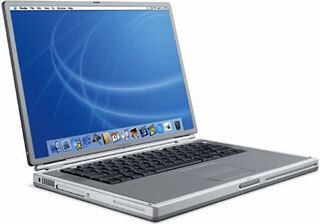 In 1994, it gave us the PowerBook 500 Series and the PowerBook Duo 280c, the pinnacle of 680x0 laptops. PowerBook 2400c with floppy drive. 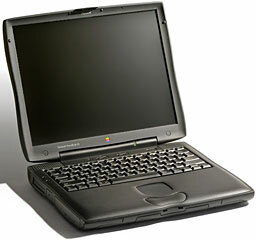 In 1997, the PowerBook 2400c was introduced in Japan, one of the few Macs never intended for the home market in the US. 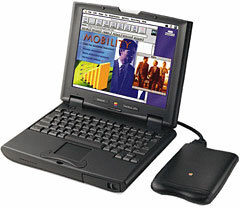 1998 gave us the WallStreet PowerBook G3 Series, which provided iMac and Power Mac G3 performance in a portable machine with lots of expansion options. 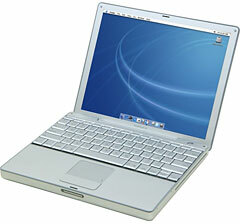 A year later, the slimmer, lighter Lombard PowerBook G3 was introduced. The iBook went on a diet, moving from the bulky clamshell design to a more sleek, all-white design with the Dual USB iBook G3 in 2001, and five years later, Apple introduced the MacBook, the first consumer notebook Mac built around Intel technology. Today our staff looks back at the development of Mac notebooks - the high points, the low points, the incredible reduction in prices, as well as features gained and lost over time. We love our PowerBooks, iBooks, and MacBooks, but we also wonder how much iPads will displace them for portable computing. Alan Zisman (Zis Mac): I bought a Dual USB iBook G3, the first generation of this model, soon after its 2001 release. It was my first Mac laptop. I was attracted by the design - which was kept intact for the following iBook G4 (12" and later 14" models) and influenced the 12" PowerBook G4, which was similar but clad in a thinner aluminum shell. It also was a strong influence on the design of the 13" screen, Intel-powered white (and sometimes also black) plastic MacBook models, which for many years were Apple's best-selling laptops. 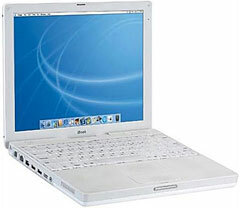 The 13" white MacBook was first released in mid-2006 and is still being sold, though only to educational institutions, giving the white iBook's design an arguably 11 year lifespan. My G3 iBook replaced a 266 MHz G3 iMac, giving me about twice the CPU speed, making for a perky system at the time. Mine came with both OS 9.1 and OS X 10.0, set for dual-boot. An 802.11b AirPort Card was an optional add-on, which I eventually purchased. It worked flawlessly for me, and I continued to use it until late 2003, when I replaced it with the just-released 800 MHz iBook G4 - but that's another story. Charles Moore (several columns): WallStreet PowerBook and Dual USB iBook. I owned them both, and they served as my main workhorse Macs for three and four years respectively. I liked both machines well enough while they were in service, but neither has stood the test of time particularly well as most fondly remembered machines. For one thing, they were the only Macs I've ever owned that suffered major hardware failures. The WallStreet's CPU melted down with no warning when the computer was 3-1/2 years old. Happily, it was easily revived with a scrounged processor daughtercard - basically a 10-minute job once I had the part in hand - and it never gave any further trouble. On the other hand, the G3 iBook, a 700 MHz Late 2002 model, died - also with no warning - very close to its sixth anniversary in service, at that point as my wife's laptop. I'm guessing it was a solder joint failure on the logic board - a fault these machines were infamous for. After trying the usual dead Mac revival routines to no benefit, I deemed it a write-off. There are other reasons that the WallStreet was the more desirable of the two. It had one of the best computer keyboards I've ever had the pleasure of using, and its connectivity and expandability were legendary, with two fully functional removable device expansion bays, two PC Card slots that I put to good use during the latter part of the machine's front-line service tenure by filling them with a USB card and a FireWire card. There was also built-in SCSI, ADB, ethernet, an internal modem, infrared, S-video, and VGA support. Access to the two RAM slots, the hard disk, and the CPU daughtercard were all easy and quick. In those respects, the WallStreet represented a high water mark in Apple laptop versatility. The G3 iBook, nominally nearly three times faster than my 233 MHz WallStreet, was almost the polar opposite. Access to the RAM expansion slot wasn't too bad, but beyond that, getting at the internals was a bit of a nightmare. There was no PC Card slot, so expansion potential was limited to FireWire and USB 1.1 devices. The keyboard was the worst of any of the Apple laptops I've owned, although I was reasonably happy with the 12.1" 1024 x 768 resolution display. If I had it to do over with 20/20 foresight, I would probably still buy the WallStreet (although the fact that it remains my most expensive computer purchase ever, notwithstanding that I got it at a trade discount from the Apple reseller for whom I was an agent at the time gives, me pause). However, instead of the iBook, I would go for a 12" PowerBook instead - a much better computer, albeit costing significantly more money. Dan Knight (Mac Musings): Although I supported quite a few PowerBooks in my IT days and have owned a fair number of previously owned PowerBook and iBooks, the only one I used significantly was the first generation Titanium PowerBook G4. In my case, the 400 MHz version, which cost "only" $2,599 in 2001. It shipped with Mac OS 9.1, a pedestrian 10 GB hard drive, and 128 MB of system memory. For that era, it was plenty of memory, speed, and storage space. Over time I upgraded to a faster 20 GB hard drive, upgraded memory a few times, later moved to a 40 GB 5400 rpm hard drive, and use a third-party CardBus WiFi card to overcome the very limited range of the TiBook's somewhat shielded AirPort Card. This was the first Mac I would use with OS X - version 10.2 if I recall correctly - and it was a fine performer with 10.3 and 10.4 as well, especially when upgraded past 512 MB of system memory. This was my primary work machine for about 2-1/2 years, when I supplemented it with a 700 MHz eMac. The performance difference was substantial, and the PowerBook became my field computer. At about 5-1/2 years, one of my sons dropped the poor thing, breaking the white plastic surround between the top and bottom titanium plates. I ended up parting out the TiBook and saved the 40 GB hard drive, which today resides in a 266 MHz WallStreet II PowerBook G3. I'd hope to turn that into a field computer, but it doesn't want to boot or wake up when running from its batteries, making the AC adapter a necessity. I also have a 366 MHz iBook SE that I've tried to turn into a field machine, but the poky 6 GB hard drive is excruciating, and the battery only lasts a minute or two - and I'm not willing to throw more money into it. I'm hoping to come up with the money for a nice used Pismo PowerBook G3, into which I could transplant that 40 GB hard drive, install OS X 10.4 Tiger, and have a decent field computer. With a USB WiFi dongle, I'd also have much better connectivity than Apple's old 802.11b AirPort Card provides.